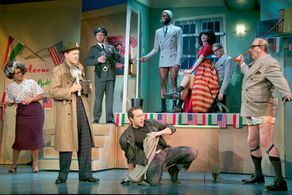 Winner of the 2015 Olivier Award for Best New Comedy, The Play That Goes Wrong bounces back into London's West End at the Duchess Theatre, following two previous runs and a sell-out season at the Edinburgh Fringe Festival. Join the Cornley Polytechnic Drama Society as they attempt to stage a complex murder mystery drama where, as the title suggests, everything that possibly could go wrong does! The over-the-top thespians struggle to keep the 1920s mystery afloat, as accident prone actors get into mischief, personal life is dragged on stage and even the set begins to collapse around them. Described as 'Faulty Towers' meets The Mousetrap, The Play That Goes Wrong is guaranteed to have you rolling in the aisles. From humble beginnings at the Old Red Lion in Islington, the Mischief Theatre Company who have both written and performed The Play That Goes Wrong join the ranks of the West End delivering this innovative farce with utter precision, expert comic timing and ruthless energy. The Play That Goes Wrong is written and performed by members of the Mischief Theatre Company. The group was founded in 2008 out of graduates from the London Academy of Music and Dramatic Art, beginning life as an improv-comedy group. Currently the cast includes Kazeem Tosin Amore, Jake Curran, Catherine Dryden, Bobby Hirston, Benjamin McMahon, Gabriel Paul, Steven Rostance, Elena Valentine, David Kristopher Brown, Liam Horrigan, Matthew Howell, Louisa Sexton and Laura White. The Play That Goes Wrong begins before the curtain has even been raised, as the audience witness the Cornley Polytechnic Drama Society preparing to stage their annual production – which this year happens to be a 1920s murder mystery 'Murder at Haversham Manor'. As props start to disappear, actors go missing and the set begins to fall down around the cast, mayhem ensues, but the amateur thespians struggle on against all the odds. But will they ever make the final curtain? And at what cost...? LOOKING FOR CHEAP THE PLAY THAT GOES WRONG TICKETS AT THE DUCHESS THEATRE? With our huge range of cheap tickets for plays on in London, a visit to the West End has never been better value. 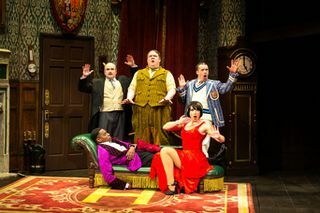 Book with us for The Play That Goes Wrong and enjoy a great play at a price that won’t bring down the curtain on your budget. The play originally ran in London at a pub theatre in Islington. Where is The Play That Goes Wrong?